Your hedgehog will spend most of his time in a cage so you want to make sure he has the best cage and accessories possible. A proper habitat will help ensure that he is safe, feels secure, and is entertained. The best way to have a happy and healthy pet is a good home. Below is a list of items that your companion will need. 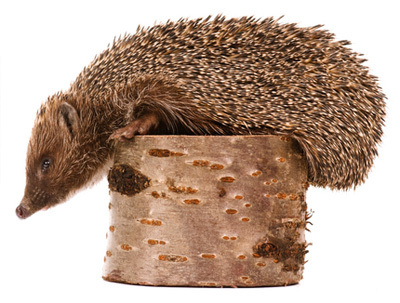 A hedgehog is small, but is very active and needs quite a bit of space. His cage should be at least 4 feet long and 2 feet wide, but go with the biggest cage possible. Bigger is always better when it comes to your pet’s home. A large wire cage with a solid floor works best. Never use a cage with a wire floor since the wire can be painful for his feet. Hedgehogs do like to climb so multi-level cages can make great homes. Luckily, there are many commercially available small animal cages that will work wonderfully. The cage should be placed away from drafts, air conditioners, heaters, windows, and other locations where the cage temperature would get too hot or cold. A hedgehog does best with a temperature of around 75 to 80 degrees F.
The cage should also be placed where he will experience both day and night. Hedgehogs are nocturnal, but they do need periods of light and darkness to remain healthy. The bottom of the cage will need a bedding or substrate. There are a variety of different types of bedding that work well. The fluffy bedding made from recycled paper or pulp is an excellent choice. Try to avoid wood shavings since some can be harmful to your companion. A hide area is a place where your hedgehog can hide, feel safe, and relax. A wood box, pet igloo, tubing, half log, or tunnel can all be used as a hide area. A hedgehog can often be trained to use a litter box. His cage will need a small animal litter box placed where he prefers to do his business. Litter pellets made from recycled paper can be used in the box. Do not use clay or clumping cat litter. Your hedgehog needs a source of fresh clean water. A stoppered water bottle is often the easiest and cleanest way to supply water. A heavy bowl, to prevent spilling, is an alternative if your pet doesn’t like a water bottle. Two food bowls will be needed for his home. One bowl is for dry food and the other is for moist food. The bowls should be heavy or easily attached to the cage to prevent spilling. Your prickly companion needs a variety of toys and items that will keep him happy and entertained. A large exercise wheel is a necessary addition to an active hedgehog’s home. Other items of enrichment can be tubing, PVC pipe, ramps, ledges, tunnels, and other decor. Toys are also needed to keep your pet active. Balls, bells, chew toys, and other small animal, cat, or bird toys can be lots of fun for a hedgehog. When you bring your pet out of his cage, a small animal playpen is a good way to keep track of him. The playpen gives the hedgehog extra room to run around and explore while preventing him from escaping and possibly becoming lost in your home. A hedgehog is not a smelly animal and with proper maintenance his cage should also be fairly odor free. The cage will need daily removal of any waste and the food and water bowls will need to be cleaned. About once a week, the bedding should be replaced. The bottom of the cage and any dirty toys or decor should be cleaned with warm soapy water. Make sure the cage and accessories are dry before replacing the bedding.